The final day of the Winter Equestrian Festival (WEF) 11 came to a close with the spotlight shining on the future stars of show jumping. Daniel Coyle (IRL) scored a victory in the $50,000 Hermès Under 25 Grand Prix Final riding CHS Krooze on the stunning grass Derby Field at Equestrian Village on Sunday, March 24. WEF comes to an end next week with the 12th and final week of competition, sponsored by Rolex, running March 27-31. Highlighting the action is the pinnacle $500,000 Rolex Grand Prix CSI 5* in the WEF International Arena during “Saturday Night Lights” on Saturday, March 30. 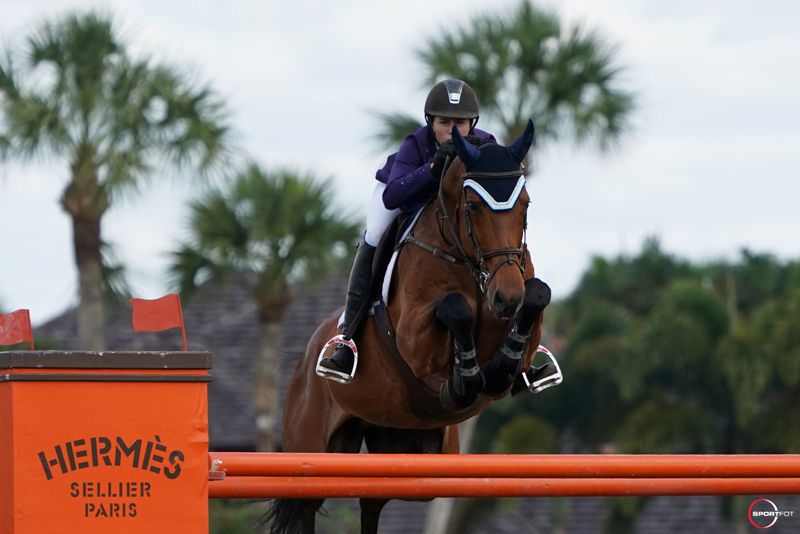 In addition, hunters will take to the Derby Field at Equestrian Village with the first round of the $50,000 USHJA International Hunter Derby on Saturday, March 30. The final day of the 2019 WEF season will host the $50,000 USHJA International Hunter Derby Round Two at 1 p.m. on the Derby Field at Equestrian Village, as well as the $50,000 Grand Prix CSI 2* and $50,000 CaptiveOne Advisors 1.50m National Grand Prix in the WFE International Arena, on Sunday, March 31, at 1 p.m.
Germany’s Olaf Petersen, Jr. designed a two-round course for 30 challengers in the eighth and final event of the Hermès Under 25 Grand Prix Series. Coyle guaranteed a six-horse jump-off from the final spot in the opening round and again saved the best for last by going clear in a blistering 39.83 seconds over the short course to bump Belgium’s Zoe Conter into second. More than three seconds behind Coyle, Conter and Univers du Vinnebus finished second for owner Stephex Stables in 43.52 seconds. Conter is ending her second season at WEF on a high note after a fall last year sidelined her for six months with a broken neck. Representing Canada, Alexanne Thibault and her mount Chacco Prime rounded out the podium in third on a time of 44.70 seconds. The 21-year-old rider commented on a long history with her mount. She said, “We got him in 2016 and the goal was for him to do the 1.40m initially, but he kept on moving up and I’ve been jumping up to the 1.50m with him. He’s so brave, so scopey, and we really have a strong partnership together. Jessica Mendoza (GBR) took fourth riding Dollar Girl for Fuchs Thomas with a four-fault jump-off round in 40.93 seconds, while Ailish Cunniffe (USA) finished in fifth aboard Baloucento 2, owned by Whipstick Farm Ltd, with a single rail in 42.17 seconds. Cunniffe was leading the Hermès Under 25 Grand Prix Series coming into Sunday’s Final and held on to secure the overall title. For her overall win, Cunniffe was presented with a Hermès mini saddle, a $10,000 store credit to Hermès, as well as an invitation to compete in Europe with transportation provided by The Dutta Corp. in association with Guido Klatte.